MyPlate is the USDA food symbol that illustrates our five food groups into a familiar image for kids. It represents a place setting for a meal. These five food groups are the building blocks for a healthy diet and MyPlate helps by prompting consumers on how to build a healthier plate. We love this organization and everything they do to inspire healthy eating habits, so to celebrate National Nutrition Month for March, we want to show you 8 of our favorite products. Be the first to fill your plate with a balanced meal that follows the USDA’s guidelines. Food cards with real life photos are self checking, backs match food groups. 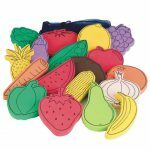 Includes activity guide, 50 food cards, spinner and 4 placemats. For 2 to 4 players, grades Pre-K and up. The perfect reminder to make USDA-recommended food choices! Kids color their own “table setting” with then add food stickers to the appropriate food groups. Teach your group about healthy food choices and the MyPlate guidelines with this activity mat! It features photo-based food cards and illustrated physical activity cards. A fun way to show kids the USDA’s new nutritional guidelines for building a balanced meal. Rugged 28″-square coated nylon pocket chart with clear pockets features the new design, 90 photo-illustrated food and beverage cards, and 5 category pockets. 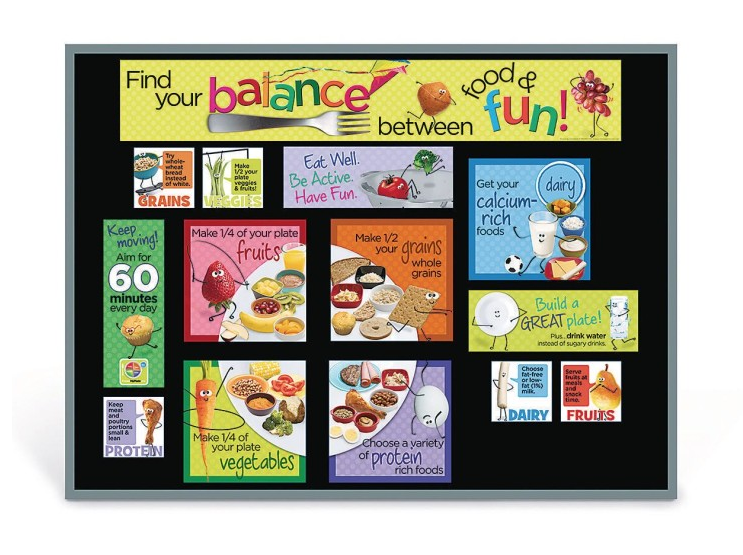 Help kids find their balance between food and fun with the Kids MyPlate Bulletin Board Kit! 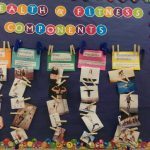 This fun and informative nutrition bulletin board kit is visually amusing and features healthy food characters engaged in physical activity. 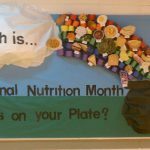 Based on USDA’s MyPlate model, this bulletin board is perfect for preschool and primary grades with simple messages and kid-sized portions of healthy food choices shown on each section of MyPlate. This game is a great way to learn and review the MyPlate food icon and each of the food groups. 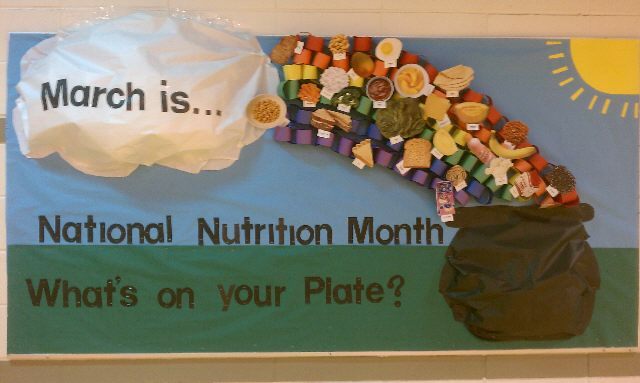 Challenge students to complete their personal plate by correctly answering questions about MyPlate, nutrition facts, food groups and physical activity. The original game is made for ages 12 and up, and there is also a Junior version for ages 3-11. With these activity books, students can explore key concepts related to portion, variety, physical activity, moderation, gradual improvement, and personalization. There are two sets, one for ages 3-6 and one for ages 7-11. They come in a set of 12. This easy-to-play game teaches USDA-recommended portion sizes. Laminated bingo cards depict foods and drinks in 5 categories: grains, vegetables, fruits, dairy and protein. Read a clue card and players cover the picture of the food they think is the answer. To see more nutrition themed products, visit our website! 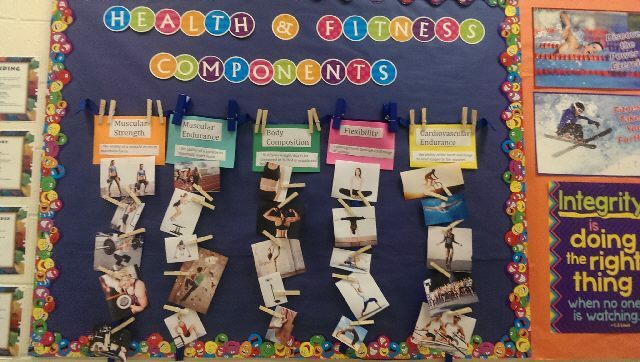 This entry was posted in Health & Nutrition, Newsletter March, Teacher Ideas and tagged Activities, diet, health, healthy, healthy lifestyle, MyPlate, national nutrition month, nutrition, S&S Products by S&S Worldwide. Bookmark the permalink.